A home construction story starts with its plan. Once the architect gets the initial requirements from the owner, the blueprint is prepared and all that has been envisioned is captured in form of a design template waiting to be executed. 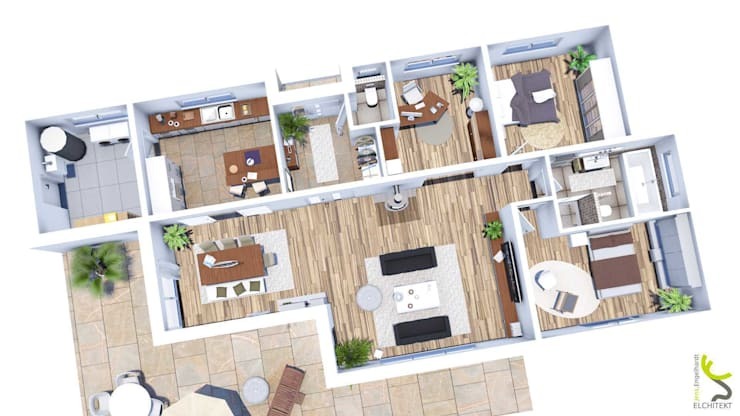 The floor plan is of prime importance because it shows how the indoor space is divided between different rooms, where the doors and windows are placed and what would the area of each room and the house in totality be. The floor plan is a drawing made by hand or (now mostly) on a computer giving top view of the entire floor area. Modern technology allows even more elaborate views like 3D from different directions allowing even a tour of the house with the help of advancement in virtual reality gadgets. Here are 10 floor plans to floor you! 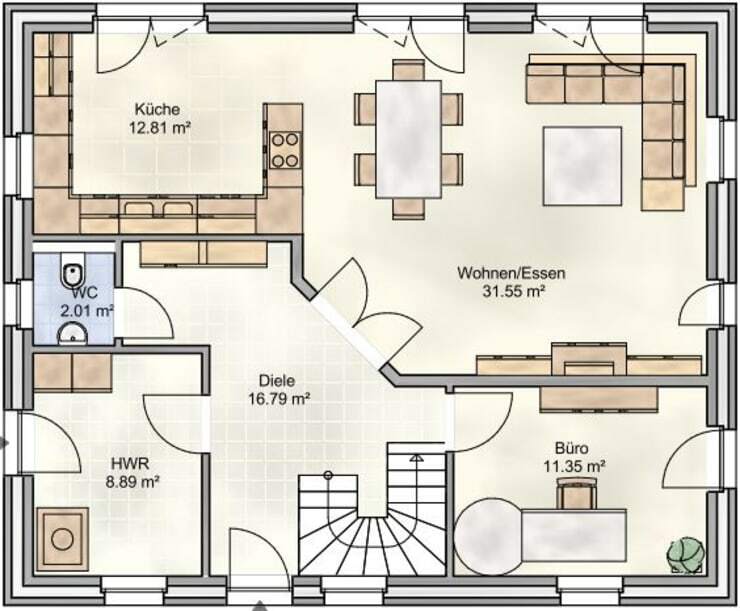 Floor plans helps with the visual presentation of the arrangement of rooms and their contents. 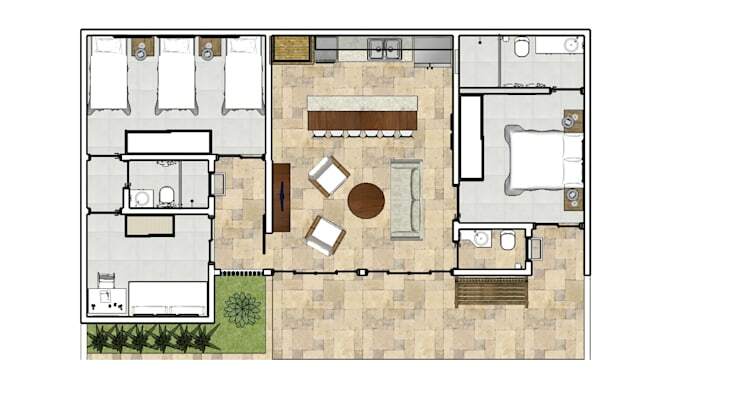 On this floor plan of a modern independent house, family and guests are welcomed in a large hallway. Instead of a cellar, the house has a utility room, where washing machine and other miscellaneous supplies are placed. In addition to a study room and a small guest WC, the spacious living area can be entered through a wing door as well. In a floor plan, doors are always shown as open. This way, it is easy to visualize which way the door will open and how can the furniture be planned better. The trend these days is to integrate an open kitchen into the living and dining area allowing more fluid spaces. The kitchen is visually separated from the room by a kitchen island, which closes with the wall. 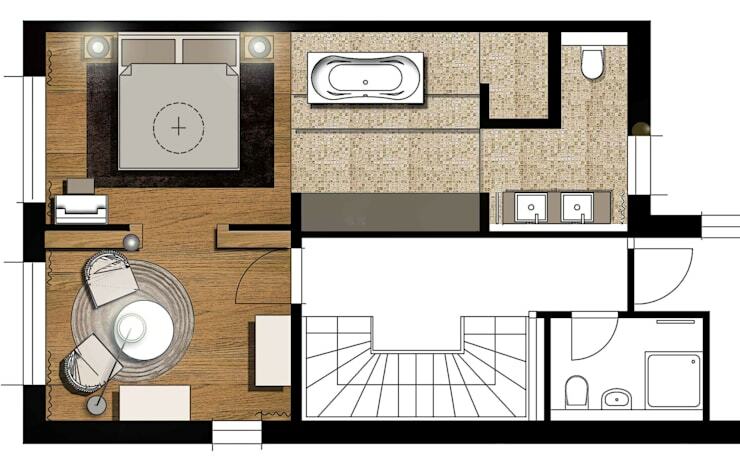 This floor plan shows the upper floor of this small house consisting only of a bedroom and a bathroom. Its easy to see that a part of the bedroom was separated by an open wall. In this part, a small seating corner has been set up which, inspite of the small space. The bathroom is designed perfectly with its hose form. One step leads to a large bathtub and the shower is clearly demarcated from the toilet by a wall. The wall cleverly makes the toilet out of view. This is the ground plan of a cozy family house with garage. Through a small corridor visitors enter a guest bath, a study and into the living area. This is equipped with an open kitchen, a dining table and a seating corner. Due to the open construction, the room seems spacious and the floor-light windows allow daylight to enter. Although the house is not particularly large, it offers space for everything. The large terrace surrounds almost the entire living area, which makes the interior even more beautiful. Until a few years ago, floor plans were represented by a technical drawing. The architects made a lot of effort to draw up the room layout and the dimensions in handwork. 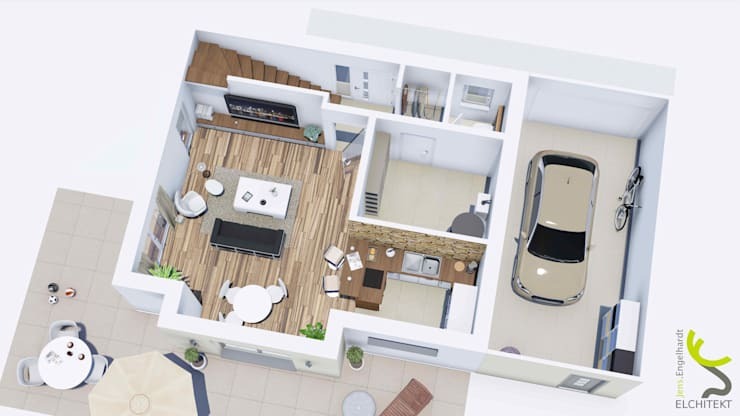 Now almost all professionals work with computer softwares, which make it possible to visualize the living space even better, including placement of furniture and accessories in minute details. This way homeowners can better imagine what the final result would look like. This bungalow is located on one floor. Life without stairs is particularly suitable for people with mobility problems, wheelchair users and children. Since all rooms are on the ground floor, bungalows on most of the ground plans usually look bigger than multi-storey houses. The living room, as is often the case, is the focus. 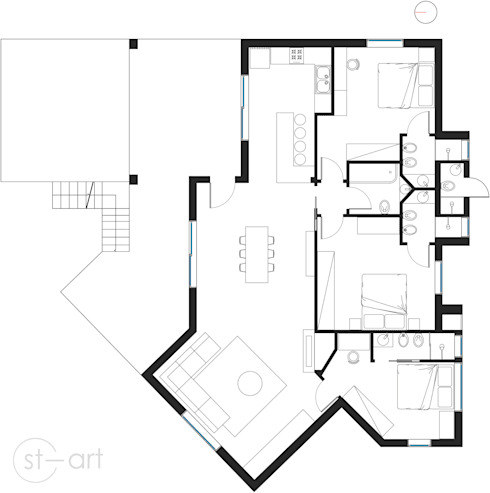 This example shows, in contrast to the previous, a closed kitchen plan adjoining the dining area. Since bungalows are mostly built without a cellar, the kitchen can be used to enter a large utility room. When buying an apartment, it is possible that the floor plans are made according to a sample or suggested by an architect . But if the new home is still in the early construction phase, the buyer can make some modifications. In this example, we see a before-and-after image, in which three rooms have become one. The owner opted for a more open-plan living space, giving him/her a larger living and dining area. Before the conversion is privately planned, it is necessary to check which walls can be removed and necessary permissions are obtained. Due to the statics and higher floors, no load-bearing walls can be worn or omitted. A penthouse above the rooftops of a metropolis is definitely indulgent and special. If it has a large roof terrace, from which one can enjoy a expansive views of the city, that's an icing on the cake! On the ground floor of this luxury apartment we can see not only the usual rooms, but also a sauna, a steam bath, a dressing room and a lift that goes directly into the apartment. The living area, offers plenty of space for an open kitchen with kitchen island and everything that belongs to a designer living room. In the warm and tropical parts of the world, open and airy construction is more suitable. In some places, the houses are completely open so that the living space as well as the kitchen and the dining area are only protected by two outer walls and a roof. 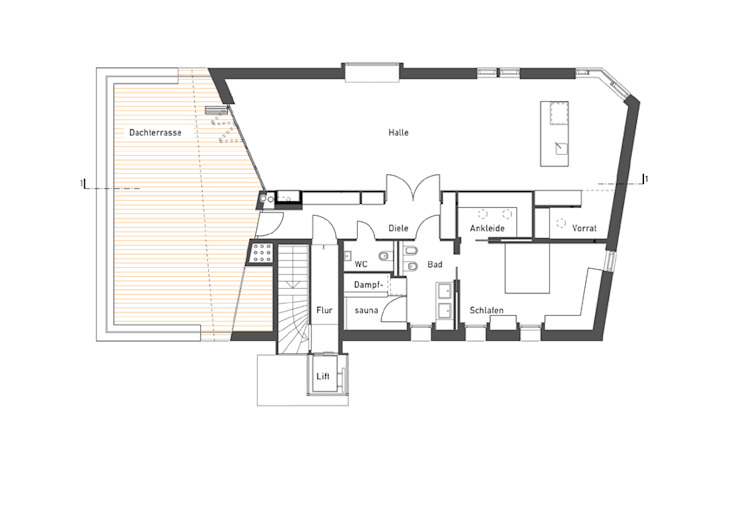 On this floor plan we see a window front, which can be opened completely if necessary. The inhabitants can therefore bring in natural light and breeze into their living space. In this plan, the architects allow a pool view for each family member by arranging the bedrooms right next to each other. The bedrooms are each equipped with a bathroom and can be reached via a long wooden walkway. An outdoor kitchen, as well as an open living room combine life in house and garden with excellent views and resort like ambiance. A multi-storey dwelling house can be perfectly represented as on this floor plan. Each floor is listed individually, whereby also lower floors are included in the visualization. The extraordinary architecture of this luxury villa makes it clear that the design dreams are almost limitless. The ground floor and the first floor have the usual living space (in luxurious furnishing) while the upper floor is crowned by a large roof terrace and a fantastic view of the pool. Square and rectangle constructions are practical but when it comes to unusual living experiences, the floor plan of the dream house can also form different shapes. Instead of straight lines the room can have slanted walls that offer space for cozy sofa corners. 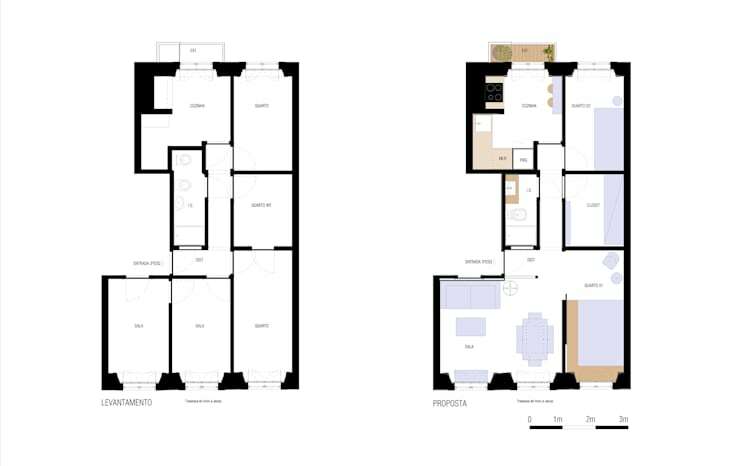 The floor plan shows a ground floor living area, which by intelligent division offers space for three bedrooms and a large living area. Each bedroom has a private bathroom with shower, while the family bathroom with bathtub is accessible from the hallway. Can't get enough? Then drool on these dream houses by prominent designers.